Will you go on an adventure with me? Today I’m launching my new Debt Collector serial, and I’m hoping you’ll come along for the ride. What’s a serial? More on that below, but basically it’s a sequence of stories, like a TV series, where each episode is connected to a larger story arc. Delirium is approx. 12k words or 48 pages, and is one of nine episodes in the first season of The Debt Collector serial. This dark and gritty future-noir is about a world where your life-worth is tabulated on the open market and going in debt risks a lot more than your credit rating. Episode 2, Agony, releases 3/27. 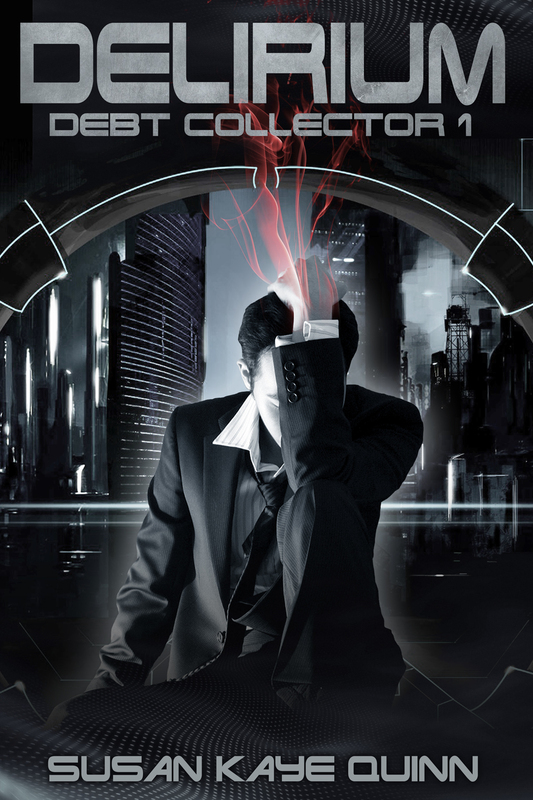 Debt Collector contains mature content and themes. For young-adult-appropriate thrills, see my Mindjack series. So where does the adventure come in? The first three episodes will be release one week apart, with the remaining episodes (nine total for the season) two weeks apart. Subscribe to the Debt Collector newsletter to be the first to know when a new ep goes up. See the Debt Collector FB page for sneak peeks and updates. When I was writing the second and third books of the Mindjack trilogy, reader feedback was a huge inspiration. If you’re coming along for the episode-by-episode ride, reading, reviewing, and commenting while I’m still writing, you’ll truly be a part of the interactive process of creating this series. Every three episodes, I’ll release a collection (Vol 1-3, Vol 4-6, Vol 5-9). The collections will be the length of a short novel. If you can’t stand to wait for the next episode, or just want to read something more novel-length, reading the collections might be a good choice for you. When the season is complete, I’ll offer all nine episodes in one large collection (which will be the length of three short novels). If you don’t mind waiting, or you’re the type that likes to get your TV series from netflix so you can watch an entire season back-to-back, this might be the best option for you. There may be a second season, but just like the TV Execs, I’m not committing to it until the first season is out. I don’t care how you choose to read the series; I just hope you’ll find the concept intriguing and want to read it in the format that suits you best. 1) I’m in for the adventure! When do we start? Right now! Get started with Delirium, then sign up for the Debt Collector newsletter, which will ONLY be used to announce new episode releases. I upload on Mondays, and subscribers will be the first to know when the lastest episode goes live. Please leave a review! Reviews really help spread the word. 2) What’s the release schedule? Official release days are Wednesdays, but episodes are uploaded on Mondays. Episode 2, Agony, releases next Wednesday, 3/27. First three episodes are one week apart, the rest are two weeks. See the Debt Collector website for the full schedule. 3) Why a serial? Why not just make Debt Collector a novel (or three) instead? Serials aren’t new (Charles Dickens was doing them back in the day), but they are seeing a resurgence due to the ease/low-cost of ebook publishing (in both self-pub and trad-pub; see John Scalzi’s Human Division, Rashelle Workman’s Blood and Snow, and Platt&Wright’s Yesterday’s Gone) . I didn’t actually plan on writing Debt Collector at all. The story concept hit me during a long car ride and simply wouldn’t let go. At first, I thought I could get away with just a novella about Lirium. Then I realized not only was there more to his story, but this particular story was conducive to episodic storytelling. Plus, I wanted to get the first Debt Collector out while I was still writing the series. So, I’m giving serialization a try. For readers who like longer works, I’m also bundling them. 4) Are you making this up as you go or have you plotted out the whole series? Yes and yes. I know where the series is going, and I won’t leave you hanging – although there may be the occasional cliffhanger. But I’m also leaving some of the details open, precisely because I want to hear from readers what they think while I’m creating the next works. 5) How many episodes will there be? Nine episodes in the first season. There may be a second season, if readers want it, but the first season will have a definitive end to it (I won’t leave you hanging there). 6) Is this a YA series? No. There’s mature content, which I hope is obvious just from the description. It’s not 50 Shades of Grey (sorry!) but it’s not intended for a YA audience either. I would say 17+, but use your discretion when recommending to younger readers. Please see my Mindjack series for YA-appropriate SF fun. 7) What about those other novels you’re writing? While Lirium has temporarily hijacked my brain, work is still continuing on my steampunk novel. And the singularity novel WILL get written… it’s just delayed. 8) I love Debt Collector! What can I do to spread the word? I’ll heart you forever if you drop a review on Amazon for Delirium (or any of the episodes/collections)! Also Like the FB page and share posts from there. Email me (susankayequinn (at) comcast (dot) net) if you’d like to post on your blog about Debt Collector. Or just tell your friends! Any word of mouth is like gold for indie authors! 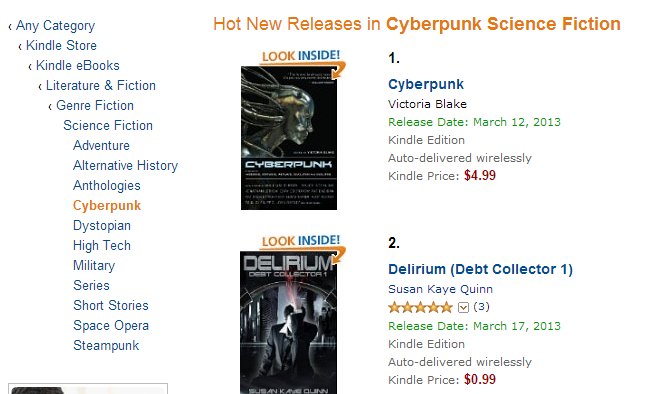 Delirium hit #2 in Hot New Releases for Cyberpunk yesterday, before the official release. Storytelling is an act of faith: on the part of the writer, that the end result will be worth the agony and ecstasy of the writing process, and on the part of the reader, that time between the pages will be well spent. This is especially true with a less familiar form, like a serial. Thank you to everyone who is taking this leap of faith with me! This adventure wouldn’t be the same without you. I can't wait until later when I get home. I'm going to read and do a big blast. This is so exciting. I've never read a serial and can't wait. Big things heading your way. I'm telling you, this has got JJ written all over it. When you become super famous don't forget about us! This is fun! Congrats on doing this, Susan! Even though I've only read the first episode, I think it works well to have it as a serial. Can't wait for episode two! Thank you Cherie! This story is definitely different in form from the others I've written – the serialization has a structure of its own. Congrats Susan! This sounds like an awesome new series. Best of luck with your series!! I have to say this is my favorite cover so far. LOVE IT!! Can't wait to read the story, too. Congrats on your new RELEASE and COLLECTION. Sounds VERY intriguing. I'm going to gift this series to a friend. He will TOTALLY get into it. OF course, I will need to get a copy too. LOL.